In recent years, off-highway vehicle use has grown significantly throughout Arizona. With 365 riding days per year, Arizona draws OHV enthusiasts from across the country to partake in our, scenic trails, and awesome weather. 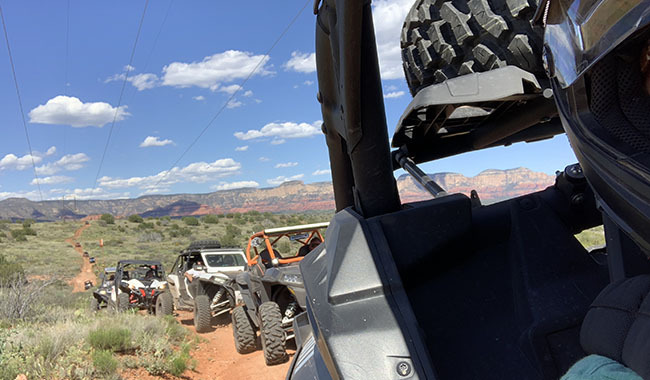 With Arizona’s growing OHV community and trails in mind, Arizona State Parks & Trails is dedicated to protecting resources while providing safe and responsible riding opportunities. 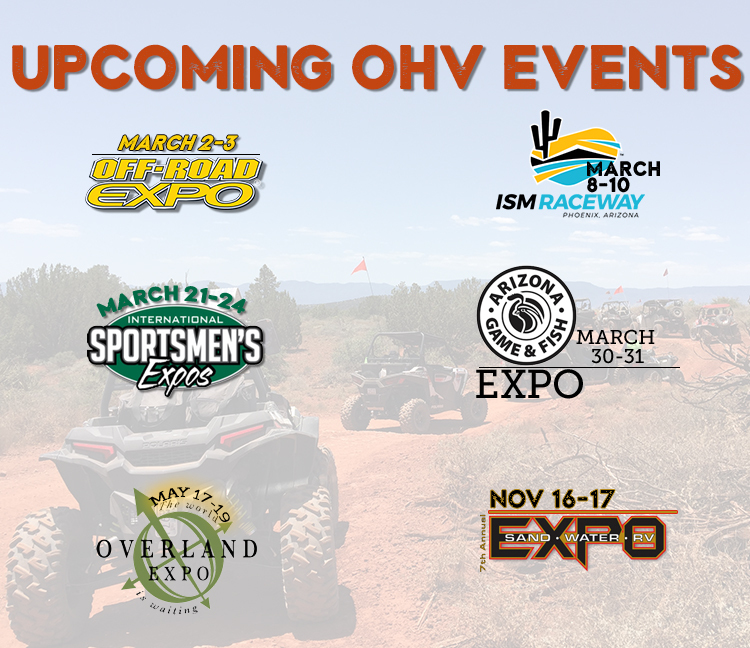 Check out the upcoming Off-Highway Vehicle events that our staff will be attending to answer questions, provide maps, and improve communication with the states OHV community. Click on the logos below to learn more about each of the events listed. Our weekend ride was a huge success! More than 100 vehicles and 200 riders enjoyed one of four different rides through the beautiful red rock country in Sedona. The weather was perfect, the dust on the trails was nominal and all riders made it safely through more than 250 combined miles of trails. 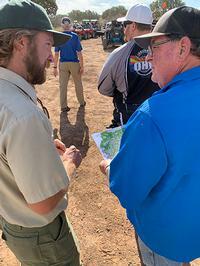 Attendees picked a trail, grabbed a map and broke up into groups of 20-30 vehicles, led by OHV Ambassadors. 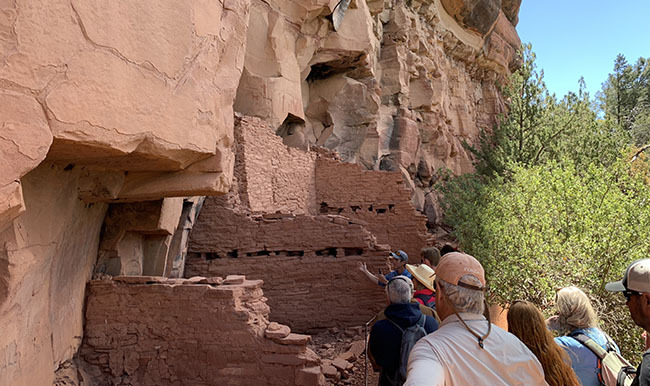 Trails visited included, Powerline Route, Diamondback Gulch, Soldier's Pass, Cliff Hanger, and a trip through West Sedona to Schnebly Hill. Groups also visited the Honaki Ruins and Robber's Roost. 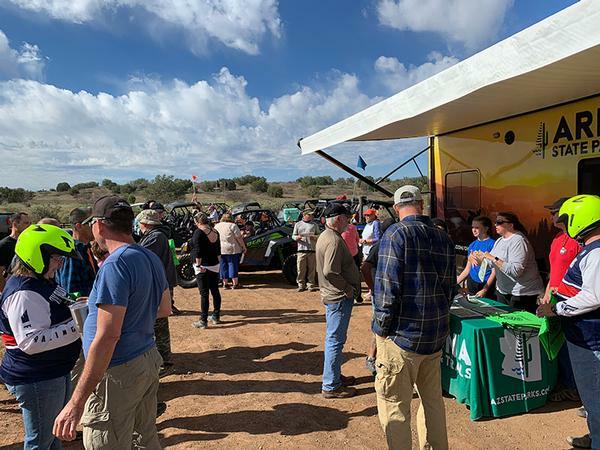 A big THANK YOU goes out to all the attendee's, our OHV Ambassadors, volunteers and, the U.S. Forest Service for their help to make this a safe and successful ride! 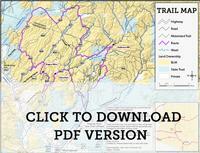 Check out the 2018-2019 schedule link below for future rides or download maps of popular routes. Watch a full map route video of the path taken by group 2 and group 4. Download images and video of this ride: PHOTO LINK. New to OHV or just want to learn the best places to ride? Join us for exciting FREE rides on trails throughout the state! Check out our 2018-2019 schedule and plan a memorable trip with other enthusiasts. 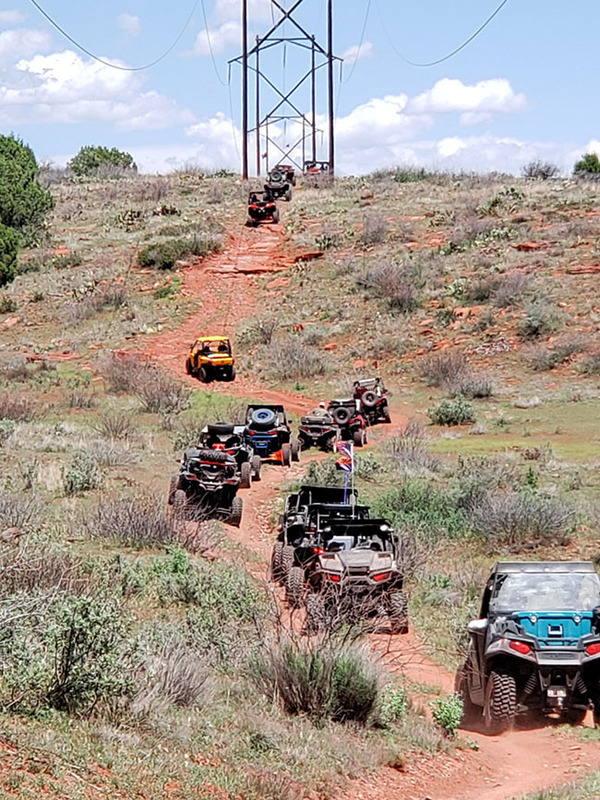 The Arizona State Parks and Trails Off-Highway Vehicle volunteers, known as "Ambassadors" love sharing their favorite places to ride with new and novice riders. The Show Me Ride program provides riders a statewide opportunity to experience new and exciting areas to ride while in a friendly group setting. Be sure to check back often for information on where we’ve been and how you can go out and enjoy the ride with your friends and family. NOTE* A valid State Trust Land Permit is required to stage your tow vehicle on State Trust Land or if you stop to enjoy other recreation opportunities on their properties. With a large staging area, training (tot) lot, tons of trail miles, and restrooms, the Boulders OHV area offers a great deal of riding opportunities from beginners to expert riders. The Jackass Flats loop off of Castle Hot Springs Road offers OHV enthusiasts a wide range of challenging obstacles, scenic desert views and passes several old mines that make for a great lunch break location. Kofa National Wildlife Refuge is part of the National Wildlife Refuge System. A national network of land and waters managed for the benefit of wildlife and recreational users. Riders experiencing the area have access to wildlife watching, photography, hiking and camping. NOTE* If you are traveling in a group larger than three (3) off-highway vehicles a permit is required. Currently a winter riding HOTSPOT, Quartzsite offers a wide range of day trip rides like this one to get out and see the desert of the southwest. This technical route is for experienced riders only. Much of the ride will be thru scenic portions of the Sonoran Desert with outstanding views and trails that wind through Saguaro and Cholla forests. This loop takes you the back way to the historic ghost town of Cleator, AZ and includes some tight technical driving mixed with some county roads. Street legal vehicles with licensed drivers are required for this route. This loop passes through the beautiful Lower Sonoran Desert landscapes and offers excellent views of the 3660' Vulture Peak. The route includes some tight technical driving with some stretches through sandy washes. Offering options for riders of all skill levels, the area surrounding Sedona is an off-road enthusiast's paradise. 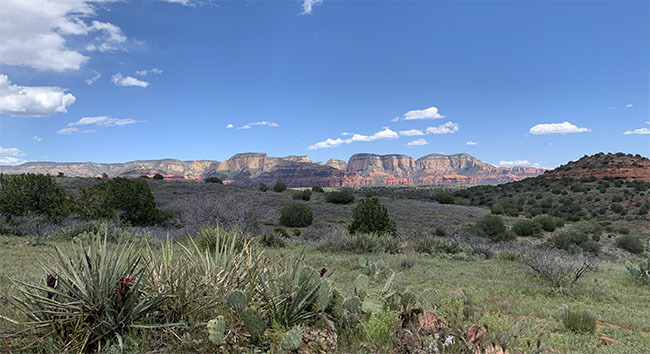 Enjoy stunning views of Sedona’s famed red rocks as you explore this popular off-highway vehicle destination. This OHV Brochure features places to ride in Arizona. Download the OHV Laws and Places to Ride Brochure. Please see page six for important informaton about the helmet laws affecting side-by-sides. Recipient of the 2018 "Volunteer of the Year Award" from the Arizona Parks & Recreation Association (APRA). This award recognizes lay persons or groups who have demonstrated consistent or outstanding volunteer service in their community and whose commitment has been in furthering the field of parks, recreation, and/or cultural and community services through excellence, service, and execution of their talents and skills.